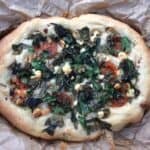 Place the flour, salt, yeast, olive oil and three quarters of the water in a large bowl and use a spoon to mix it together into a sticky dough. Knead it in the bowl for five minutes and add the remaining water slowly. 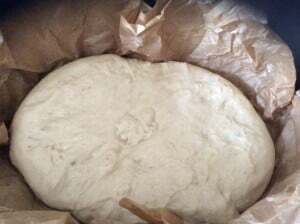 Stretch the dough out in the bowl and then fold in into the centre, keep turning the bowl little by little and continue stretching and folding for five minutes. It will gradually become less sticky and more elastic. 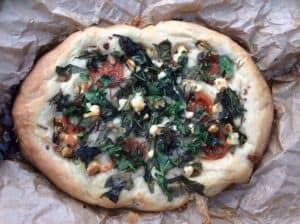 Turn the dough out onto an oiled surface and knead it for another five minutes. Place the dough in an oiled bowl, cover it with clingfilm, and allow it to double in size. This rise took about an hour for me. Line the bowl of a large slow cooker (I used one which is 5.7 litre) with a double layer of baking paper. 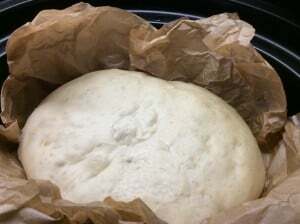 Place the dough in the pot on the baking paper and stretch it out to roughly the size of the base of the pot. Place the lid back on the slow cooker, turn it onto low and allow the dough to prove for an hour. After an hour on low, the dough will rise well again. 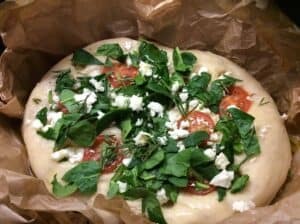 Drizzle the dough with olive oil, and make some holes with the end of your finger to push in the halved tomatoes and crumbled feta. Scatter the chopped spinach and rosemary leaves on top. 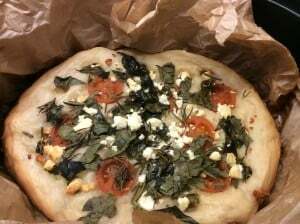 Drizzle over a little more olive oil, and some sea salt, and it is ready to switch onto high to bake. Bake for approx. 1-2 hours on high. After 1.5 hrs on high with a tea towel under the lid, the focaccia baked well! To brown off the top a little more, place it in a hot oven for five minutes.